Two tracks from the perhaps not so mysterious any more Man Power accompany two remixes on new label, Not An Animal. Man Power does his thing mixing Altair 4`s Agpreppo umpah with bongos, tin-can percussion, High Energy bass lines, keyboard feedback and Italo arpeggios-a-go-go, all with Prog aplomb and dressed in a Rick Wakeman cape. He`ll be doing it on ice next. With dwarves and a miniature Stonehenge. For the remixes Ess O Ess shake tambourines and a scratchy wah wah riff, swapping the arpeggio overload for a solitary guitar, while Backwoods take inspiration from classic Detroit Techno and the complex cosmic harmonies of Kenny Larkin and Stacey Pullen. Not An Animal is the vinyl off-shoot of London`s Bad Passion party, run by Chris Stoker & Andy Bainbridge, conceived as a vehicle for their own musical output (as Ess O Ess & Machete Savane respectively) and that of their friends and the artists who have supported the parties. 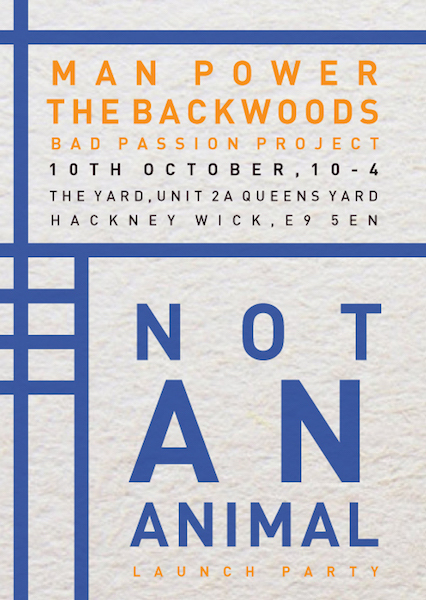 They`ll be throwing a launch for the label and single on October 10th, at The Yard in Hackney Wick, with the bill headed by both Man Power and Backwoods.